Narrowing scenic drives in South Africa down to ten is not easy. 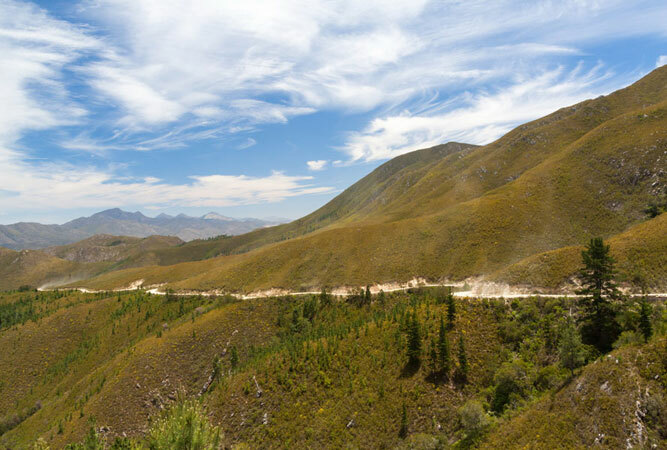 Just the mountain passes in each of the provinces would leave you speechless for months (the Swartberg, Sani and Bainskloof passes in particular). And so we’ve selected a number of longer routes, some of which incorporate mountain passes, from across the country. Each of these drives has a unique beauty. Drive as many of them as you can. 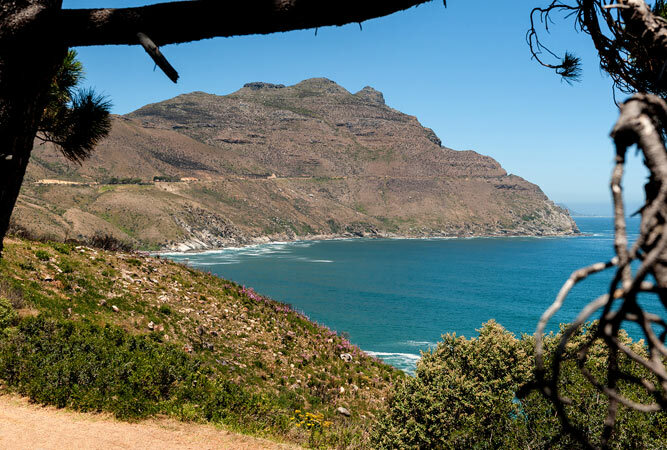 Regarded as one of the most dramatically picturesque drives in the world, Chapman’s Peak is the M6 coastal road linking Hout Bay to Noordhoek on the Atlantic Ocean. Only 9 km in length, the route is a concertinaed series of curves and bends that dangerously skirt the rocky coastline. Not only was it a major engineering feat to create the road, it has been a feat to keep it open due to dangerous and frequent rock falls. It is called ‘Chappies’ by the locals, and forms part of the Argus Cycle Tour. The drive involves a toll. 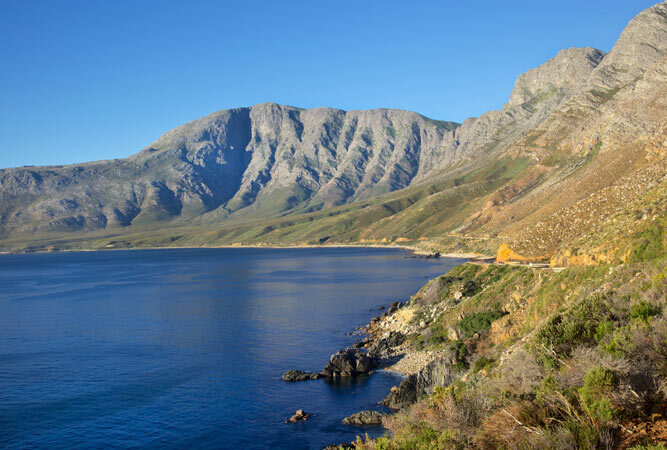 Fast becoming one of the most popular drives in the Western Cape after Chapman’s Peak, the coastal road between Gordons Bay and Betty’s Bay – Clarence Drive, or Route 44 – is one of the most scenic drives in the country. If you want an eyeful of blue sky, blue seas, mountain peaks, whales, penguins, seaside villages, nature reserves, cliff paths, hiking trails, caves, a botanical garden and sheer artistry when it comes to the great outdoors, then Clarence Drive should be top of your list. Also on the whale route it is best done as a weekend trip. The 8 mountain passes of the Eastern Cape feature in what has become known as the ‘wild side of the Drakensberg‘; also known as the Drakensberg Highlands – an unspoilt area rich in rewarding scenery and incredible beauty. It is possible to do most of the passes in a 2×4 vehicle, but high clearance is best, and you need a spirit of adventure to complete the slow route between Lady Grey and Elliott. The passes include: Joubert’s Pass, Lundean’s Nek, Volunteershoek Road/Bistone Pass, Carlisleshoek, Naude’s Nek (the highest pass in the country), Bastervoetpad, Barkly Pass and the Otto Du Plessis Pass. This coastal corridor is a stretch of the south-eastern coast of South Africa, driven along the N2 between Mossel Bay and Storms River. Named for its idyllic and lush vegetation awash with forests and nature reserves, this part of the country experiences rain all year-round and an oceanic climate that produces a natural beauty second to none. Excellent beaches, inland lagoons, lakes, undulating hills, the mountains of the Outeniqua and Tsitsikamma, and indigenous forest between Wilderness and Knysna form the backdrop to a never-ending list of things to do. Drive the 7 Passes Road for a real treat. A favourite motorbike route is the breakfast run from Johannesburg to Harties (Hartbeespoort Dam) in the Magaliesberg. Many do it as a circular route. It is a lovely drive – along R512 (join at Northgate shopping mall) to the dam (where a quick pitstop somewhere like Pick a Pancake is requisite), around the dam to catch a glimpse of the pretty homes in Kosmos, and then on the R560 via Hekpoort to the town of Magaliesburg (yes, the spelling is different to Magaliesberg, the area) where you can stop for lunch (there is also a train ride out to Magaliesburg from Johannesburg, but not via Hartbeespoort Dam). 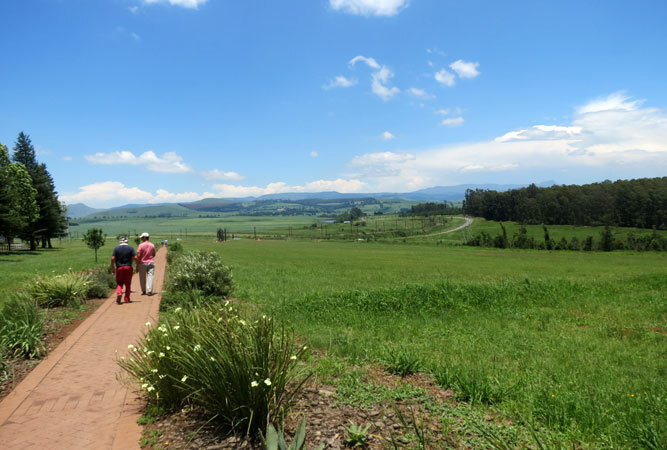 Kwazulu Natal’s Midlands Meander is over 80 km of sightseeing route that winds through typical green countryside in the middle of the province, between Pietermaritzburg and the Drakensberg. Also an arts and crafts route these green hills of Natal are awash with family-friendly activities, creative outlets, nature reserves, little villages, forests and eateries that (with map in hand) make a wonderful alternative for weekends and holidays for those visiting the area. Without doubt one of South Africa’s most scenic drives, the Maloti Route spans 280 km between Phuthaditjhaba and Rouxville, hugging the Free State border with Lesotho and passing through a list of idiosyncratic and infrequently visited Free State towns along the way. The scenery is gobsmacking, the mountain country incredible and the little towns delightful. The only adversity are the potholes, but one can even forgive these, given the experience the route affords. 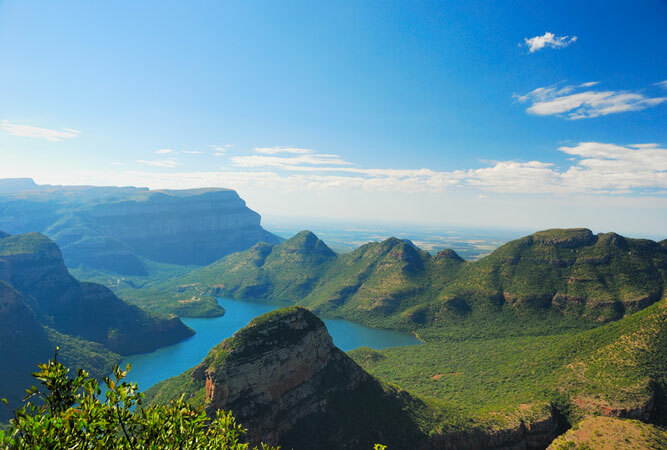 The self-drive Panorama Route explores the mountains, forests, waterfalls and Blyde River Canyon of Mpumalanga. The route links Sabie, Graskop, Pilgrim’s Rest, Mac Mac Pools and Falls, Graskop, the Pinnacle, God’s Window, Wonder View, Lisbon Falls, Berlin Falls, Bourke’s Luck Potholes, and the Three Rondawels. In-between these scenic natural wonders are a collection of other attractions with no end to photographic moments. Easily driven in a day, you might want to take longer for the sheer beauty of the route. Route 62 is known as the longest wine route in the world. With its starting point in Cape Town, it offers an alternative to the N2 highway to Port Elizabeth, meandering in amongst the wine villages of the Karoo and exposing one to a wealth of diverse and beautiful landscapes that include rivers, vineyards, orchards and a series of valleys and mountain passes (the alternative name for Route 62 is the Mountain Route) most of them built by Andrew Bain and his son Thomas. Much of it is off-the-beaten-track, particularly the far reaches of the route, closest to PE. If you only have time for part of the route, drive Cape Town to Oudtshoorn, and back again. Also known as the Daisy Route, the Cape wild flowers draw thousands of visitors a year to the semi-desert of the Namaqualand, annually metamorphosed into a profusion of blooms. Just after the first winter rains what was desert comes to life and the Karoo and Kalahari’s dry grey scrub bursts with colour. 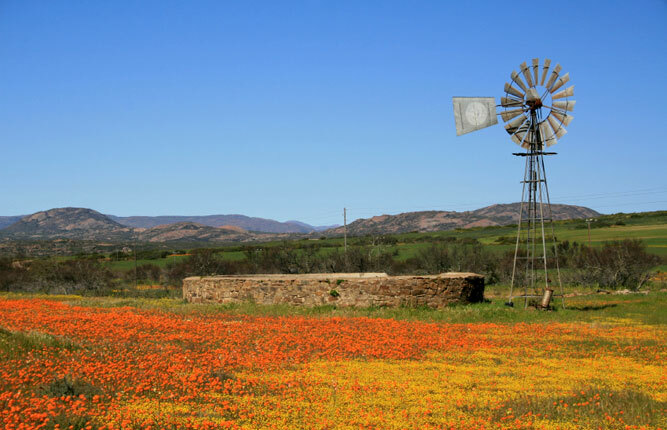 It takes about five hours up the R27 or N7 to reach the Namaqualand from Cape Town. Either take a guided tour, or do your research beforehand as there is no specific order in which to do things.